We were told that until 1992, when Barcelona hosted the Olympic games, Barcelona was not a popular tourist destination. For the Olympics, the city made major investments in the Metro system, a substantial redevelopment of the waterfront area and other infrastructure to support tourism. Now, some 10 million people will visit Barcelona this year. The most visited monument in Spain, La Sagrada Família, is in Barcelona. It’s difficult to describe the structure. The simple explanation is that it is an unfinished Catholic church designed by Catalan architect Antoni Gaudí. Construction began in 1882 under the initial direction of Francisco de Paula del Villar but very soon he resigned. Gaudí quickly began to revise del Villar’s design with his innovative engineering and architectural style. He wanted soaring heights both inside and out. 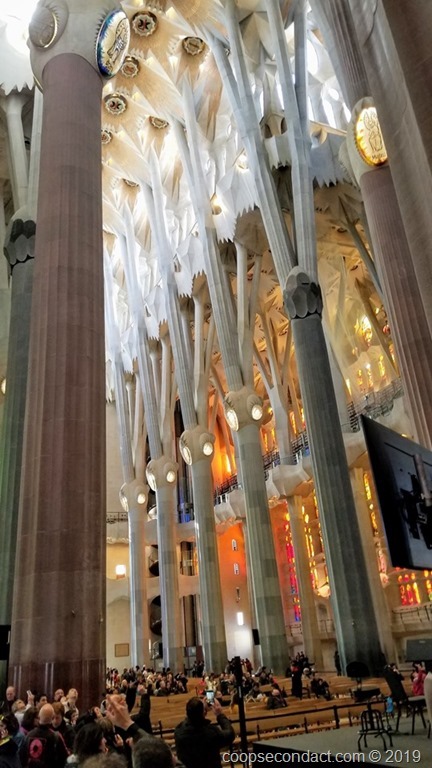 His interior design used pillars with “branches”, much like trees, to provide support for the structure, allowing the generous use of windows in the walls which allow generous natural light to stream in through the stained glass. At the time of Gaudí’s death in 1926, less than a quarter of the project had been completed. Then in 1936, during the Spanish Civil War, anarchists set fire to the crypt and destroyed much of the interior including Gaudí’s plans and models. This left the project very much in doubt. Eventually, construction was resumed after designs were pieced together. Computer aided design and advancements in engineering allowed builders to execute Gaudí’s vision. Construction is expected to continue until 2026 with completion planned for the 100th anniversary of Gaudí’s death. Gaudí is certainly the most known of Barcelona’s Modernist architects but he is hardly alone. 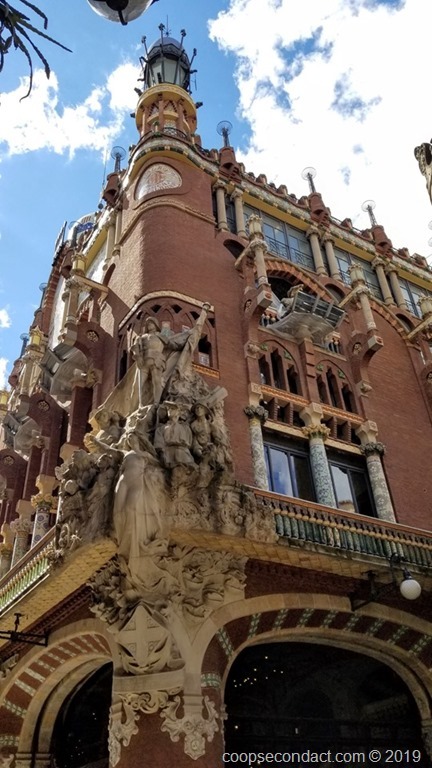 In the late 19th century, Barcelona had experienced a dramatic transformation due to the industrial revolution and this gave rise to a new architectural style that was flamboyant and intended to show off newfound wealth. You only need to see Palau de Musica, designed by Lluís Domènech i Montaner to see the “over the top” flamboyance of this new style. Another beautiful example of the Modernist style is Casa Amatller, the palatial residence of chocolatier Antoni Amatller, designed by Josep Puig i Cadafalch. Sadly, during our visit, Gaudí’s Casa Batlló, perhaps his most widely recognized work, was undergoing renovations. Another opportunity to see Gaudí’s work is in Park Gűell. Eusebi Gűell entrusted to Gaudí’ the plan to create an estate for well-off families in a large property that Gűell had acquired which had splendid views out to the sea beyond the Plain of Barcelona. The building work progressed well in the first years of the 1900’s but the exclusive nature of the estate and the lack of proper transport made the project unviable. Gűell chose to halt the work in 1914 and the property was sold to the city in 1922. It was opened as a public park in 1926. 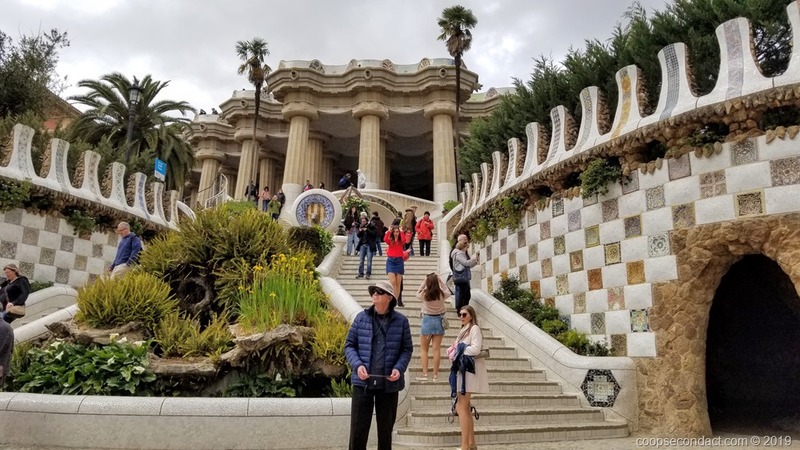 Fortunately, Gaudí’ had completed some viaducts, walking areas and some spectacular structures at the park entrance, particularly the flight of steps that lead to the Hypostyle or Columns Room. Barcelona has its own Arc de Triomf which was built as a gateway to an 1888 Universal Exhibition. The arc stands at the entrance to Parc de la Ciutadella, the location for the event. Just inside the park you will find the massive Cascada Monumental, built in the 1870’s as a new city fountain, loosely modeled on Rome’s Trevi Fountain. The eye grabber is the gold sculpture of Aurora riding four horses sitting on top. We got lucky to have a beautiful sunny day to take the trip to Montjuic, a hill just off Barcelona’s waterfront. 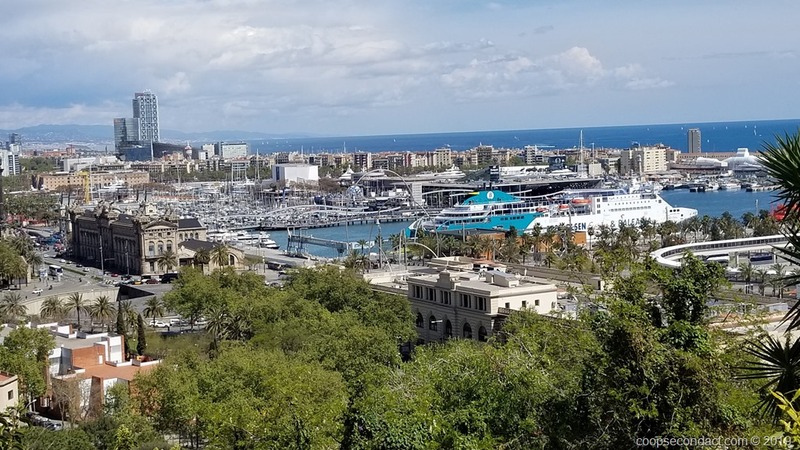 We took the Metro to reach the Montjuic Funicular which took us to the top of the hill where we could visit the Montjuic Castle. The castle has a long and, at times dark and bloody history. It has played a part in both defending Barcelona and being used to attack and control the inhabitants of the city. In 1939, at the end of the Spanish Civil War, thousands of those who found themselves on the losing end were brought here and executed. We had great views of the city and the waterfront from the hilltop. In addition to the castle, Montjuic has the Olympic stadium used for the 1992 Olympics. Pablo Picasso, born in Malaga, Spain, in 1881, moved to Barcelona with his family when he was about 15 years old. He had already shown great talent as an artist and was enrolled in the School of Fine Arts. He spent many years in Barcelona and the Picasso Museum here holds an extensive collection of his early works. One of the very interesting parts of the museum comes from his later years. As a teenager he spent time studying in Madrid at the Prado Museum. There he studied Velazquez, Goya and El Greco. In the late 1950’s he began copying the Velazquez painting Las Meninas (The Ladies-In-Waiting). 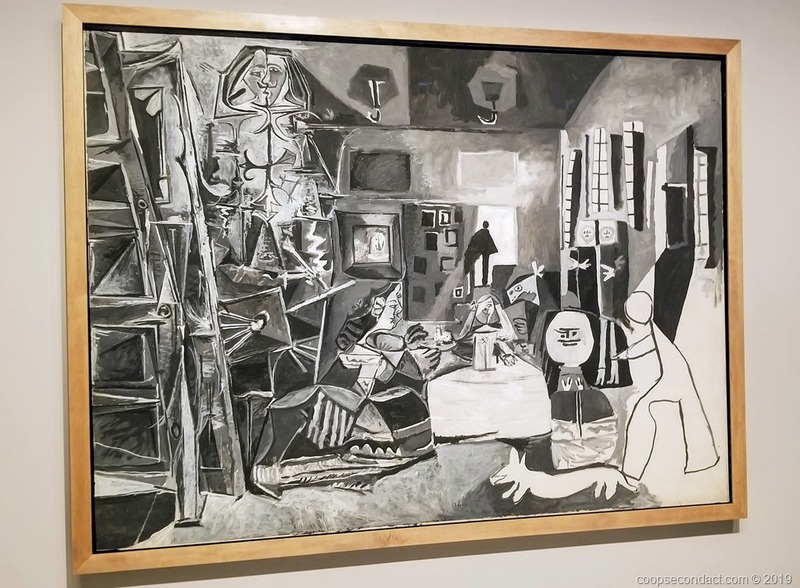 There are two rooms with many Picasso paintings of the individuals from the painting as well as his interpretation of the full painting. 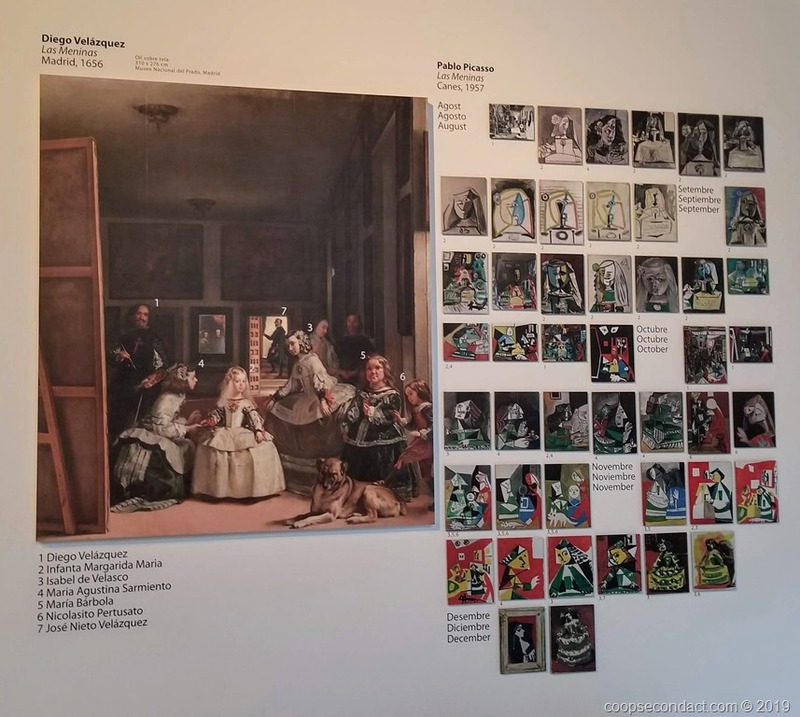 The top photo above shows the Velazquez painting along with several of Picasso’s paintings of the ladies. The bottom photo is one of many that Picasso painted as his interpretation of the Velazquez painting. And now, the obligatory mention of food. Eating in Barcelona is very fun. In the Barceloneta and El Born sections, you will see tons of small bars with food, particularly, pintxos. 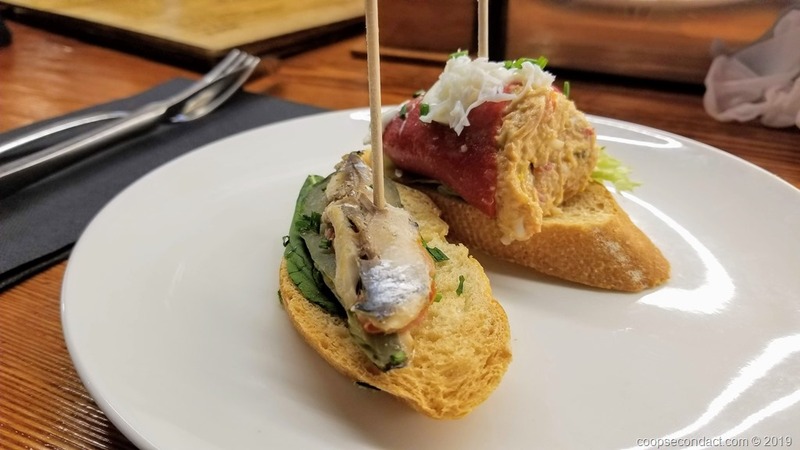 These are similar to tapas but in Basque country, they specialize in these small bites stuck with a toothpick. In a bar serving pintxos, you order a drink and then you can help yourself to whichever pintxos appeal to you. You keep the toothpicks and then get charged accordingly when you finish.